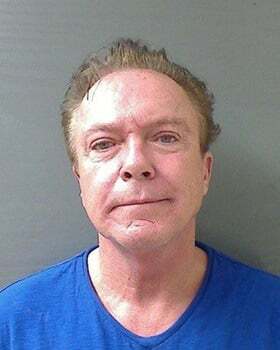 Former teen idol and Partridge Family star David Cassidy was pulled over early this morning on suspicion of drunk driving. After a lengthy exchange with a police officer that included a field sobriety test, the suspicion didn’t exactly subside, and he was arrested and charged with driving under the influence. The sad incident took place just outside Albany, New York. According to TMZ, Cassidy was driving down the road when an officer noticed he had his high beams on. He quickly pulled the singer over, and after a brief exchange, he decided a field sobriety test was in order. Cassidy reportedly flunked that, and when he submitted to a breathalyzer test, he blew .10, which is over the legal limit in New York by about 25%. Given his blood alcohol level wasn’t ridiculous, Cassidly would seem like a good candidate to get a slap on the wrist, but unfortunately for the sixty-three-year-old, he has a history. He was arrested in Florida for driving under the influence back in 2010, which automatically makes this brush with the law a felony. With Cassidy spending much of his time out of the limelight these days, it’s hard to know exactly how he’s doing mentally and physically. His step-mother Shirley Jones recently said he’s battled some demons over the years, and between that quote and these two DUI arrests, the prettiest picture isn’t exactly being painted. That being said, there’s no reason to think David can’t find health and happiness. Ordinarily, it’s extremely difficult for stars when their moment in the sun passes. Luckily, he seems to have found something he’s passionate about that he can devote his time to. That’s huge and ideally, should serve as a source of inspiration not to drink. Cassidy hasn’t commented publically on his current legal problems, but if he does decide to release a statement, we’ll make sure and bring it to you. Until then, Pop Blend’s sincerest thoughts go out to the once world famous star as he struggles. Here’s to hoping he makes wiser choices moving forward and continues taking just as much joy in breeding horses.